Description: Dorothy Bauer Conga Drum - Dorothy's interpretation of a conga drum, done in clear and black rhinestones, set in goldtone, perfect for that percussionist on your list. 3-D, 1 1/2" x 1 1/4" x 1/2". 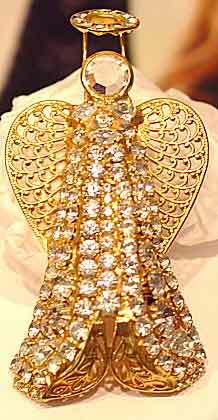 Description: Bauer 3-D Angel Pin - One of the prettiest angel pins I've ever seen. 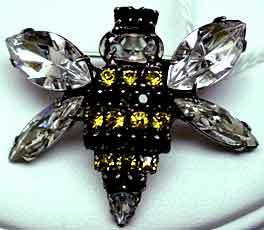 Done in goldtone with all clear rhinestones, this uses a heart shaped filigree for the wings, a clear unfoiled glass stone for the face and a rhinestone wheel for the halo. 2 3/4" x 1 1/2". 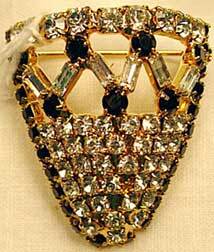 Body stones are all prong set, halo stones are paste set, and face is bezel set.